As the plane took off from Heathrow airport on that hot July day, I couldn’t stop thinking of what I might have left behind in Beirut . My DC pad keys? Heaven forbid my passport? Soon, Patti Griffin’s “Long Ride Home” playing on my ipod brought back memories of a part of me that got lost between business meetings and travels, and failed relationships. It was hard to push away the bittersweet thoughts of a land that helped shape who I am. Memories of war, shelters, hatred, disappointment, despair, and broken hearts came crawling back though strangely enough they were overshadowed by memories of laughter, love, family, and friends, weddings and baptisms, and funerals. The long ride to Washington opened the door for much thinking and an emotional walk down memory lane. I remembered that accidental email I received ten years back from a now estranged friend informing me of the death of my uncle in a car accident. I reckon seeing my uncle a few months before I left Lebanon when he came to wish me a safe trip to the Lone Star State . A few years later, dad calls to tell me that my grandfather had died. By 2005, I hadn’t visited my family in almost five years. I was on the road all the time, so I had a lot of excuses. I wasn’t there when my brother and sister graduated. I wasn’t there when my close friends got married. I’ve missed many things in my life because of this self-centered belief that so many people depended on me to get the job done and done right. Over the past decade, distance has always been a big thing for me. Not just physical distance, but emotional distance. And if you’re emotionally distant from people, especially those you’re romantically involved with, they eventually leave. I didn’t have time to argue against breaking-up back then and more so I didn’t care, I had me. That was enough. Sometimes, it takes bad news to get real and that’s exactly what happened in 2006. It was the kind of non-fatal bad news that hits a family member; the kind that tells you:”wake up, you have another chance”. Suddenly you realize how much they mean to you and how much your life depends on them; strange feeling when you live so far away, yet so true. 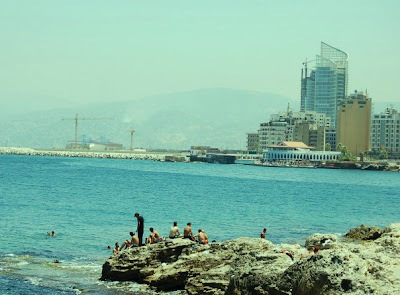 The two weeks I spent in Lebanon this summer were not much different from what I expected them to be. It was the same old stories about politics, corruption, and sectarianism. Expect well, I was there for a reason. I came to Lebanon to attend my best friend’s wedding and meet my sister’s significant other. I came to listen to my father nag about cost of living; I came to see my brother’s new pad. I sat in my mother’s kitchen everyday for lunch and dinner talking about family. I came to debate politics with my sister’s boyfriend through the wee hours of the morning. I came to listen to the same old stories that made me laugh a decade ago, and well, they still do. I came to hit the club scene in Beirut so I could complain about the vanity of the happy few in Lebanon afterwards. As the plane landed in Washington late into the night and was welcomed home away from home, I had already started to make travel plans for Christmas and I anticipate to be back home several times in 2009 for various event. It never occurred to me to think once that life is here and now. But this is it, no return or exchange policies, and no second chances for the time wasted, but perhaps opportunities to learn. So where do I go from here, well, I’m pretty sure there’s going to be more of the same business trips, maybe a serious relationship, and a whole lotta laughing and eating around that kitchen table up on the hills of Mount Lebanon overlooking the Mediterranean. *Marwan Madi is Lebanese. He has lived in the US where he works in Consultancy for most of the past decade. He writes on Lebanese politics and the interface between various cultures from a personal perspective. Your presence gave meanings to a lot of things that were naturally going around either at home or during friends’ gatherings… We can always feel how a part of you remains each time you leave and how this part is getting larger each time. Travel can also be the spirit of adventure somewhat tamed, for those who desire to do something they are a bit afraid of.